I really enjoyed the Sweet Heat Starbursts, so when my friend Melissa mentioned that she saw the Skittles version at Wawa, I drove over there (got some gas) and grabbed a bag. Now we shall see is these items are unique enough to stand on their own, or if one should reign supreme. 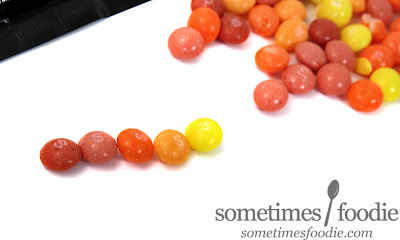 In the Sweet Heat Skittles mix we get five flavors, while Starbursts only gives us four. 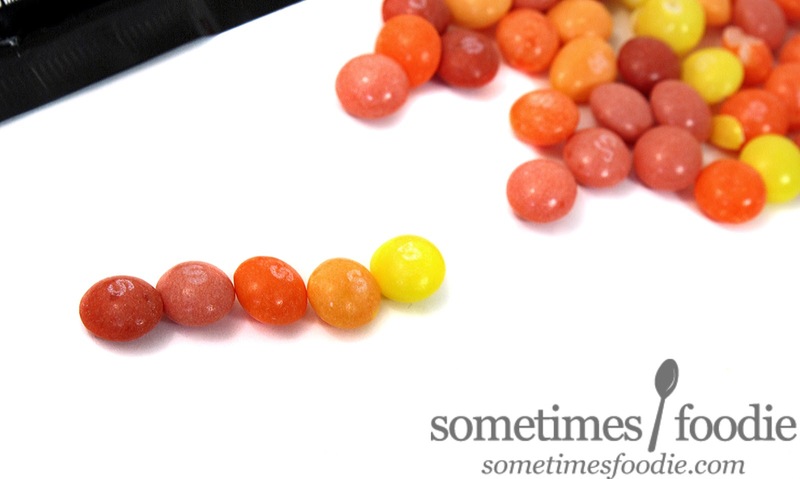 The Skittles flavors are: Fiery Watermelon (Starburst repeat), Flamin' Orange (Another Starburst Repeat), Sizzlin' Strawberry, Lemon Spark, and Blazin' Mango. Now, I feel a little annoyed with this mix because there's only one new flavor. The first two listed were exact Starburst repeats, the other two are the Strawberry Mango Starburst flavor separated into individual Skittles, which leaves us with the new, and intriguing, "Lemon Spark." I still have a few Sweet Heat Starburst on my desk, so let's jump into the review and see if these are the exact same flavors, just in a different form, starting with the exact dupes. Fiery Watermelon (Slightly darker dusty pink) - Even though the texture is different, due to the crunchy sugar shell, the grittiness doesn't mask that this flavor is exactly the same as the Starburst chew. It's a sweet Airheads-like artificial watermelon with some dry cayenne pepper heat. It makes the back of your throat tingle, just a bit, and builds up to a slow but subtle burn that makes me want to eat more. It's a dupe, but a delicious dupe. This is my favorite flavor in both mixes and it's wonderful. Flamin' Orange (Slightly darker orange) - Has that same Orange Julius vibe as original Orange Starbursts, and Skittles. The texture of this one is giving it the illusion of being more of an orange creme flavoring than the Starburst version, but it's still identical to it's Starburst namesake. I liked this one less than the watermelon one in the Starburst mix, and that still rings true. It's good, and enjoyable, and with some moderate jalapeno-pepper heat (although it's still on the mild end of the spectrum.) Good, but not great. Sizzlin' Strawberry (pale dusty pink) - Packs more strawberry punch than the original red, strawberry, Skittle. This has a sweet, slightly floral, flavoring with cotton candy-notes, and then you start to feel a mild spiciness towards the back of your tongue. Almost like a spicy pink Starburst! So far, this has been the least spicy flavor, but it really is yummy and I may like this representation of strawberry more than the one in the original mix! The spiciness is more dry, like the watermelon flavor, but it's pretty tame. Balzin' Mango (peachy-orange) - In the Starburst version, strawberry and mango were combined into one flavor. Now that they've separated into their own candies, the strawberry can really shine, while the mango fizzles out. The mango has this slightly unripe Pine-Sol-like flavoring that just doesn't taste good. It's kind of like eating mango salsa with a spoon, it needs something else to bring it all together. I think it's about the same weak-sauce heat level as the strawberry, but this time the flavor isn't strong enough to make up for it. So far, this is my least favorite. Lemon Spark (yellow) - The only new flavor in this mix. Wow, this is easily the least spicy flavor in the bag. As I chewed I got some classic, sweet, lemon Skittle flavoring, although it seems bolder than your normal yellow Skittle. The heat takes a decent amount of chewing to show up, but at the very end, once everything is chewed and swallowed, a bit of heat begins to kick up in the back of my throat, causing a mild tingle. I think the first three flavors packed more of a punch, but this one tastes great and paired nicely with all the other flavors, so I'll let it slide. 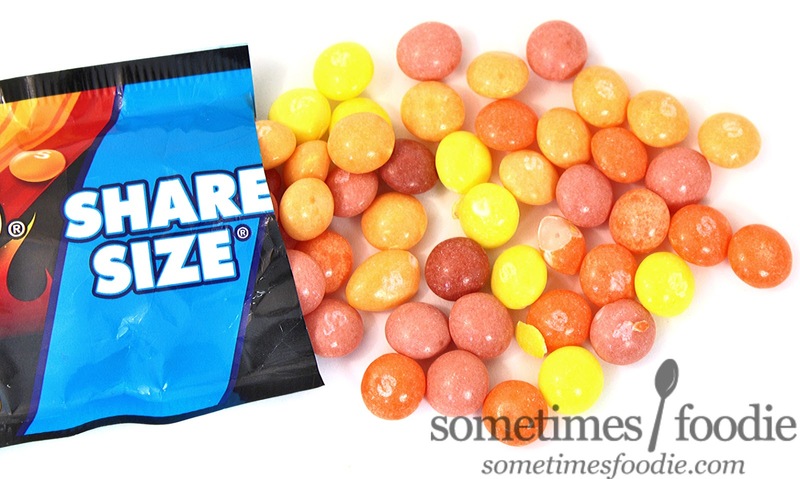 In Conclusion, Sweet Heat Skittles and Starbursts are not strong, stand alone, items, they're two ways to eat the (almost) exact same thing, but if only one product can survive, I'd want it to be these Skittles. They're smaller, easier to eat/share, and by adding lemon to the mix you can create different flavor combinations. Really what it boils down to is the Skittles offer a slightly more versatile snacking experience. I feel like the combination of sweet and spicy makes for a very satisfying snacking experience. I'd definitely buy these Skittles again, and I hope they stick around...but I'm afraid they won't. I tried to share both Sweet Heat items with several people, and no one wanted to give them a chance. (Well, my boyfriend did try two of the Starbursts, but he wasn't a fan.). It seems like I'm the only person in my social circle that likes these, and that doesn't bode well for their longevity. That being the case, I highly recommend trying these while you can, because their shelf-life might be limited, but if it comes down to it, I hope the Starbursts are the ones to go.